These are printed forms with hand-written insertions shown in blue. This seems to be an annual licence. A number of questions arise. Where are the Well House and Hail Croft in Bosbury? Why did Thomas Kington give his address as John Benbow’s farm in Castle Frome? Is this the same Thomas Kington who was a Primitive Methodist? (certainly John Benbow was one and converted to Mormonism) The printed document refers to Protestants only. To the Right Reverend the Lord Bishop of Hereford and to his Registrar. 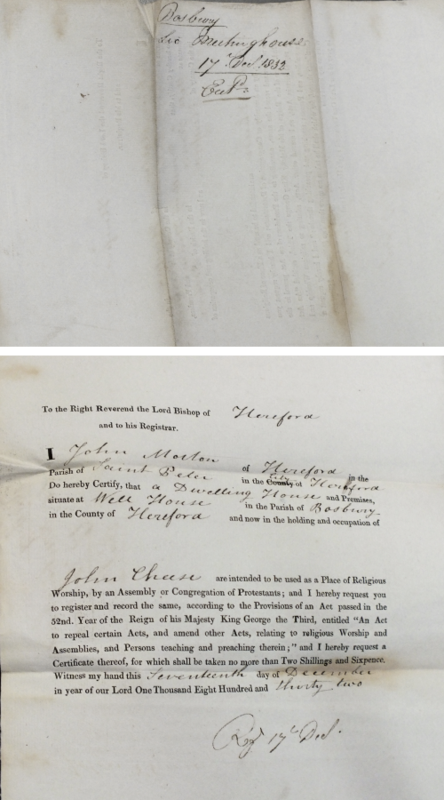 Do hereby certify, that a Dwelling House and Premises, situate at Well House in the Parish of Bosbury in the County of Hereford and now in the holding and occupation of John Cheese are intended to be used as a Place of Religious Worship, by an Assembly or Congregation of Protestants; and I do hereby request you to register and record the same, according to the Provisions of an Act passed in the 52nd. year of the Reign of his Majesty King George the Third, entitled, “An Act to repeal certain Acts, and Amend other Acts, relating to religious Worship and Assemblies, and Persons teaching and preaching therein;” and I hereby request a Certificate thereof, for which shall be taken no more than two Shillings and Sixpence. Do hereby certify, that A Dwelling House and Premises, situate at Upper Pens in the Parish of Bosbury in the County of Hereford and now in the holding and occupation of Peter Bannister are intended to be used as a Place of Religious Worship, by an Assembly or Congregation of Protestants; and I do hereby request you to register and record the same, according to the Provisions of an Act passed in the 52nd. year of the Reign of his Majesty King George the Third, entitled, “An Act to repeal certain Acts, and Amend other Acts, relating to religious Worship and Assemblies, and Persons teaching and preaching therein;” and I hereby request a Certificate thereof, for which shall be taken no more than two Shillings and Sixpence. Do hereby certify, that the house of Sarah Davies and Premises, situate at hail croft in the Parish of Bosbury in the County of Hereford and now in the holding and occupation of the said James Thomas are intended to be used as a Place of Religious Worship, by an Assembly or Congregation of Protestants; nd I do hereby request you to register and record the same, according to the Provisions of an Act passed in the 52nd. year of the Reign of his Majesty King George the Third, entitled, “An Act to repeal certain Acts, and Amend other Acts, relating to religious Worship and Assemblies, and Persons teaching and preaching therein;” and I hereby request a Certificate thereof, for which shall be taken no more than two Shillings and Sixpence. Do hereby certify, that the house of Samuel Bagstor and Premises, situate at hail croft in the Parish of Bosbury in the County of Hereford and now in the holding and occupation of this said Margaret Kendrick are intended to be used as a Place of Religious Worship, by an Assembly or Congregation of Protestants; and I do hereby request you to register and record the same, according to the Provisions of an Act passed in the 52nd. year of the Reign of his Majesty King George the Third, entitled, “An Act to repeal certain Acts, and Amend other Acts, relating to religious Worship and Assemblies, and Persons teaching and preaching therein;” and I hereby request a Certificate thereof, for which shall be taken no more than two Shillings and Sixpence. Do hereby certify, that the house of Sarah Davies and Premises, situate at hail croft in the Parish of Bosbury in the County of Hereford and now in the holding and occupation of this said Margaret Kendrick are intended to be used as a Place of Religious Worship, by an Assembly or Congregation of Protestants; and I do hereby request you to register and record the same, according to the Provisions of an Act in the 52nd. year of the Reign of his Majesty King George the Third, entitled, “An Act to repeal certain Acts, and Amend other Acts, relating to religious Worship and Assemblies, and Persons teaching and preaching therein;” and I hereby request a Certificate thereof, for which shall be taken no more than two Shillings and Sixpence.